Come in and choose your favourite place at our hotel Saigerhütte in Olbernhau Grünthal! Furnished with a lot of love and an eye for detail, you can look forward to a unique holiday-domicile in a historical setting. For 20 years now our cordial team spoils the guests, so that they can just unwind. Arriving, relaxing and savouring – in the natural, stylish ambience of the buildings "Hüttenschänke" and "Haus des Anrichters" you will leave the daily routine far behind. Find your own personal favourite place in the midst of 400 years of history of our hotel and the magnificent surrounding of the Erzgebirg-region. At our hotel you spend your time on historical grounds. Our two striking buildings are not only a desired photo-motif, but part of the to-be world heritage "Montainregion Erzgebirge". Since today you can learn about the rare art of "Saigern", a method to obtain silver and copper from ore in former times. You will sense a feeling of warmth and cosiness in all of our stylish renovated rooms. Flexible and individual in their size all rooms are flooded with a felicitous symbiosis of traditional wood works with a modern character. According to your requirements you can choose from single- or double-rooms, spacious premium double-rooms or exclusive suites. There are further possibilities if you travel with children. Start your day in a good mood with our pick-me-up breakfast. Homemade jam and lemonade side by side with regional, fresh products from the baker and butcher just around the corner, are pure seduction. For the allergic person we offer lactose- and gluten-free products. And do not hesitate to contact us if you have any further dietary requests, i.e. vegan food. Rooms are equipped with minibar, television, wifi and telephone as well as bathtub or shower, lavatory, hair-dryer, cosmetics-mirror and toiletries..
Let us seduce you in our restaurant „Hüttenschänke“. Prepared and spiced with passion, our typical regional and seasonal kitchen, based on fresh ingredients will pamper you. And a mediterranean inspiration is just giving the last cut to fresh, innovative food on a beautiful laid-out table. And we recommend one of our fine wines from the wine cellar to accompany your meal. Enjoy all this as well open-air on a balmy evening on our terrace or in the ‚feel-good’ garden overlooking the historical flair of the Saigerhütte. You are planning more than a small dinner in a intimate setting? For private functions and events you can choose from three historical function-rooms and our rustic barn. We also offer catering-services. We do not claim that everything is possible – but a lot. With us you will find space and ease to do things you often do not find time to do. Retreat with your favourite book under the apple tree in the ‚feel-good’ garden. Or day dreaming and gaining stamina in the romantic arbour? Equally you can have a holiday full of activities. Signposted hiking- and biking-trails start directly at the hotel. Or discover the fine and premium works of the Erzgebirge handcraft in one of the many workshops in Olbernhau or in the nearby toy-village Seiffen. Detect the ‚Erlebnisheimat’ Erzgebirge with all her beautiful facets. No matter how you decide: you can be just yourself! By the way: In the Middle Ages the Saigerhütte was an independent small town of her own. 22 buildings still exist and invite you for an exciting stroll. Birthday, wedding, confirmation, company anniversary or BBQ with friends just like that ... life is full of highlights. All of them should be unforgettable - moments to remember. No matter how many guests you are expecting, you will find the perfect spot for your festivity in the Saigerhütte-area. In our Kupferkeller you van celebrate in a jovial setting for up to 60 people.for up to 180 people you can enjoy your special day in the rustic Scheune. For technology lovers we recommend the powerhouse Saigerhütte for up to 160 people.or you celebrate with up to 200 guests in the municipal Treibehaus with its chic industrial architecture. No matter which location you choose, we will create your festivity in an individual and professional manner – from the first planning to creative catering. Additionally, we also come to your own home and pamper you and your guests in a familiar setting with a culinary experience. First-class like our catering is also the selection of fine wines in our wine-depot. You found your favourite? Take a bottle home with you and think about the wonderful time you had with us while having a sip. Arrive, relax, forget about the daily routine. Enjoy the silence, the surrounding nature and gain energy for new activities in life. Take your time off for a great time, young and old together, which you will remember for a long time. In each cardinal point you will find attractive places of excursion. 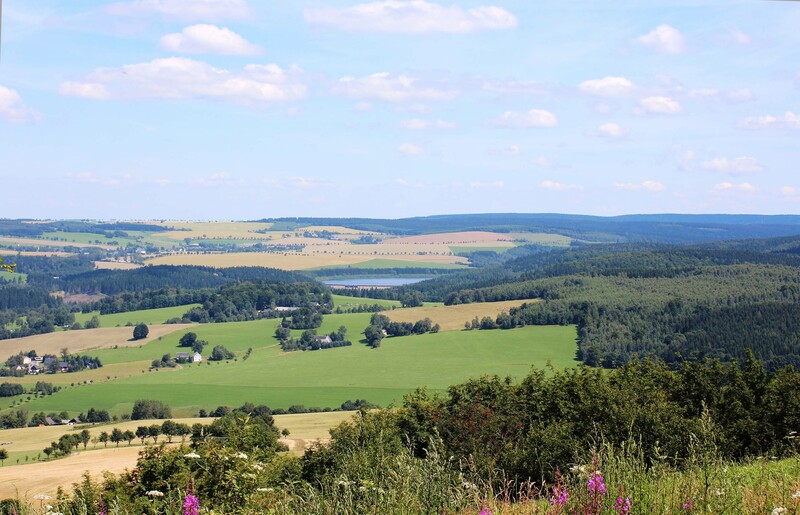 9 certified tours on winding roads through the Erzgebirge are waiting for you. – including Stopps with stunning views. As a certified partner of the trade journal „Tourenfahrer“ we know exactly what you need. You stay directly located toothed hiking trails E3, EB, WDE and the quality trail Kammweg. Our hotel ist the first certified hotel in the Erzgebirge "Wanderbares Deutschland". Our most beautiful time – enjoy the unique Christmas-spirit with his rites and fascinating ligths, miners, ‚Schwibbögen and pyramids. Your arrival is scheduled for Sunday and you book for 5 nights, then you will get one free night. You want to stay at lest for 7 nights, then you will get one free night. You just enjoy and book at least 13 nights, then you will get three nights for free.